FIIs were net sellers of equity on Mon. and Tue. (Feb 18 and 19) but turned net buyers on the last three days. Their total net buying was worth Rs 50.3 Billion. DIIs were net buyers of equity on all five trading days. Their total net buying was worth Rs 46.5 Billion, as per provisional figures. On Fri. Feb 22, net buying by FIIs exceeded Rs 63 Billion, which turned them into net buyers month-to-date. A bulk deal in Kotak Mahindra Bank (ING sold its residual 3% holding) was the probable reason. Nifty’s EPS for Q3 (Dec ’18) hit an 11-quarter low of Rs 96.50. This is the first instance since Q1 (Jun ’16) when the EPS slipped below Rs 100. It was also the 4th consecutive quarter of lower-than-estimated earnings for the Nifty 50 companies. The daily bar chart pattern of Sensex closed below the 200 day EMA on Mon. and Tue. (Feb 18 and 19) after 2 months – thanks mainly to FII selling. Just when it seemed bears were getting the upper hand, the index pulled back above its 200 day EMA towards the Fibonacci resistance zone (between 36140 and 36810). Despite strong combined buying by FIIs and DIIs, resistances from the merging 20 day and 50 day EMAs capped the pullback rally. 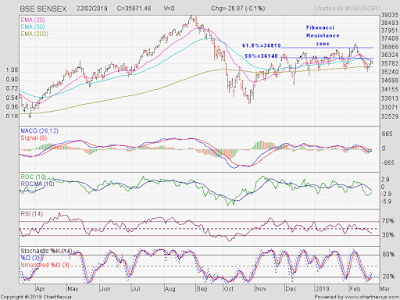 The index closed above its 200 day EMA in bull territory, but eight straight days of lower closes and the Valentine’s Day massacre at Pulwama has dented bullish sentiments. Daily technical indicators are looking bearish. MACD is moving sideways below its falling signal line in neutral zone. ROC is moving up towards its falling 10 day MA in bearish zone. RSI is sliding down towards its oversold zone. 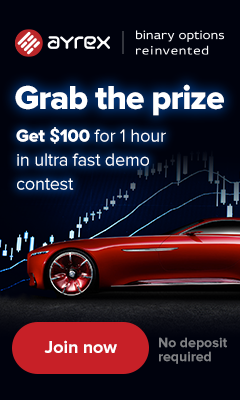 Slow stochastic has emerged from its oversold zone. The government has been announcing several sops for various sections of citizens in a belated effort to curry favour with voters before the general election. The stock market has so far reacted with indifference. With no visible bullish triggers on the horizon – monsoon is too far away and Q4 (Mar ’19) results of India Inc. are unlikely to be any better – there is a distinct possibility that Sensex may succumb to gravity. The weekly bar chart pattern of Nifty formed a ‘reversal’ bar (lower low, higher close) for the 6th time in the past thirteen weeks. Bulls need not expect a strong pullback rally. The index closed above its 50 week EMA but faced strong resistance from its 20 week EMA. FII buying can cause some more upside, but is unlikely to propel the index above the Fibonacci resistance zone (between 10880 and 11090). Weekly technical indicators are looking neutral to bearish. 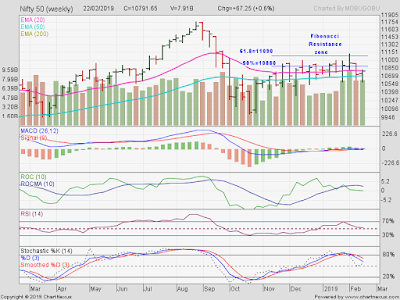 MACD, ROC and RSI are moving sideways in neutral zone. Slow stochastic is falling towards its 50% level. Nifty’s TTM P/E has moved down to 26.32, but remains well above its long-term average in overbought zone. The breadth indicator NSE TRIN (not shown) has fallen into its overbought zone, and can limit near-term index upside. Bottomline? For more than 3 months, Sensex and Nifty charts have been consolidating sideways after sharp corrections during Sep-Oct ’18. Both indices managed to close above their long-term moving averages in bull territories, but are unlikely to cross above Fibonacci resistance zones. The consolidations may continue with a downward bias.